Located on the lakeshore, Lincoln Park is a comfy neighborhood with an upscale vibe. As your go-to movers in Lincoln Park, we’ll help you settle on a cozy, quiet street a few blocks from some spacious, swanky shopping. In Lincoln Park, brand name stores are big, local boutiques are one-of-a-kind, and there’s always something cool around the corner. You’ll enjoy all the amenities you need, including a sweet 1200-acre park for nature, culture, and purebred dog-watching. 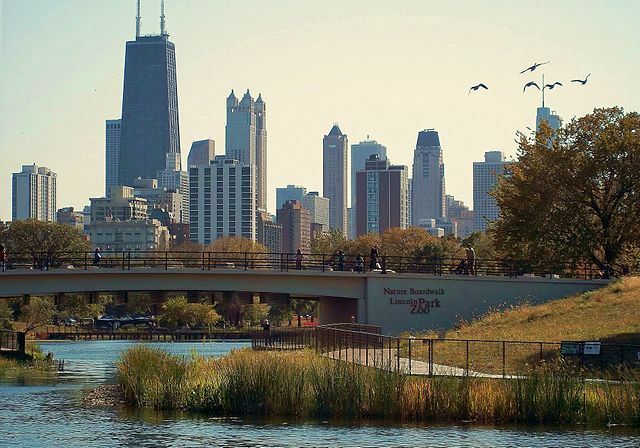 Lincoln Park is home to about 65,000 people (and their dogs). That’s mostly singles, with some families, and just a few more women than men. The average Lincoln Parker is around 30 and earns six figures. Also, 1,250 animals live in the Lincoln Park Zoo. Lincoln Park Township officially joined the city of Chicago in 1889. Early on, a community from northwestern Poland migrated to Lincoln Park and brought its unique culture along. Decades later, the neighborhood welcomed Chicago’s first Puerto Rican immigrants. Lincoln Park is still stamped with both groups’ histories. Now you’ve got the gist, here are some highlights—and basics—we found to help you start your Lincoln Park life. Lincoln Park (the park): Indoor and outdoor activities. The Lincoln Park Zoo: Free. The Peggy Notebaert Nature Museum: Free trails, single-digit admissions, Green City Farmer’s Market. The Chicago History Museum: Themed tours, events. The DePaul Art Museum: Free. Kingston Mines: Historic blues venue. Victory Gardens Theater: Formerly the Biograph (look it up). Live performances. Arclight Cinemas: Full bar and menu, ‘hassle-free’. Pizza: Bacino’s. Delivers deep dish on the next level. Vietnamese: Fuh. Delivers what it promises. Burgers: The Butcher and Burger. Delivers 100+ options, many vegan friendly. Brunch: Batter and Berries. Worth the wait. Groups: Venezuelan Bowl Grill. Huge portions in casual setting. BYOB. Celebrations: Alinea. One of many fine dining choices. Cocktails: The Barrelhouse Flats. Artisanal mixes paired with signature foods. Music: The Tonic Room. Live entertainment for over a century. Family Night: The Galway Arms. Full menu, live Irish music. Dancing Late: The Drop Lounge. Closes around sunrise. Being Local: The Burwood Inn. Games and trivia. Whole Foods: Two levels, parking, countless lunch options. Trader Joe’s: Busy at peak times. Apple Finer Foods: Local, no alcohol. Starbucks: Every block. North and Wells open 24 hours. Next Door Café: Local, group workspace. Cocoa + Co: Serious treats. Orangetheory Fitness Lincoln Park: Basics. Lincoln Park Athletic Club: Climbing wall, indoor pool. FFC Lincoln Park: Sundeck, childcare, indoor pool. Ward 43 resident parking zones. This has been a tiny sampling of the great things you’ll experience at your new Lincoln Park home. As a seasoned Lincoln Park moving company, we’ve learned all about the staples and cool places in the area. We’re happy to share more! As you’re planning your big move, cross one major thing off your to-do list, and book Lincoln Park movers who’ll a take load of stress off your mind. Call us at New City Moving, and we’ll help you move safely, smoothly, and on-schedule, so you can settle right in and start living your best Lincoln Park life.